Despite its hole-in-the-wall appearance and somewhat obscure location – behind a large velvet curtain at Le Parker Meridien Hotel – Burger Joint serves up one of the tastiest hamburgers in town! And in doing so has become an absolute gem in an otherwise touristy part of Midtown where a decent and affordable eat can be hard to find. Burger Joint’s menu is small and simple. It reads, “If you don’t see it. We don’t have it!” Literally the choices are between a hamburger or cheeseburger. Topping options are minimal too: lettuce, tomato, sliced pickles, mustard, ketchup (oh no she didn’t) and mayo. And the sides, well only a side order of fries are on offer. I took Burger Joint’s uncomplicated menu as a sign that these guys do what they do and do it well. And I was right! Nick’s burger and mine were cooked perfectly. The patties were juicy, the buns lightly toasted and the combination of toppings deliciously flavourful. Like the no nonsense and no frills menu (the menu itself is written in marker on a cardboard cut out) so to is the décor. 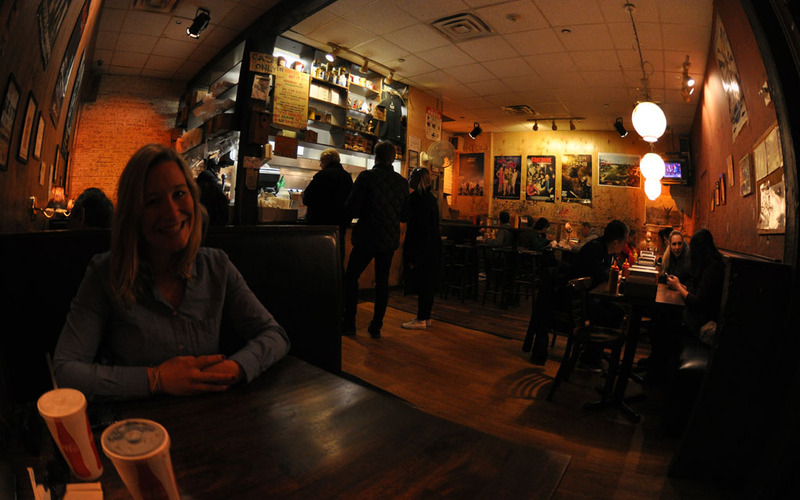 The restaurant is dimly lit, with graffiti covered timber paneled walls, vinyl booths and tarnished hanging photos. The vibe it gives off makes it feel more like a Williamsburg eatery than a restaurant inside a fancy Midtown hotel. 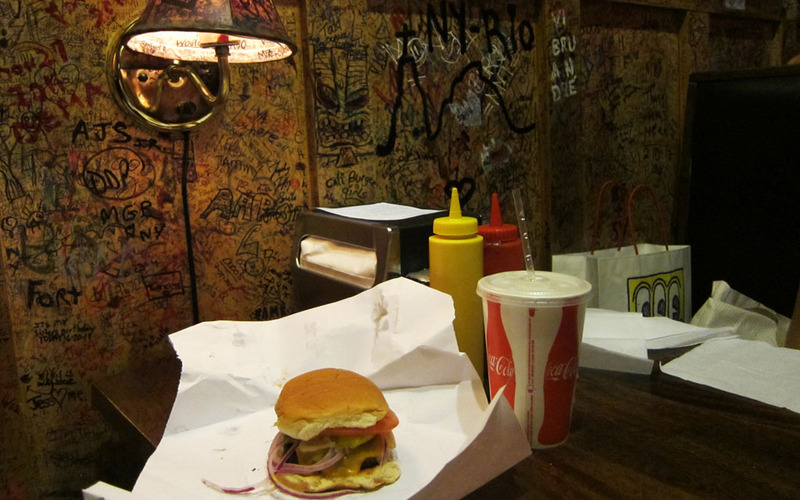 Now just because of Burger Joint’s not so secret, “secret” location, don’t assume that it’s easy to get a seat. It’s a small place with only a handful of tables and once 12:30pm hits the line becomes impossibly long. If you do find yourself there at a busy time you can always get your burger take away and walk over to Central Park, which is only a few blocks away. Or you can call ahead and place an order for pick-up. While writing this post I found out that a second location has since opened at 33 West 8th Street, Greenwich Village, 10011.